House called to order at the usual order hour, Mr. Abney in the chair. Mr. Bryan was nominated and elected a member of the Society and was duly initiated, along with Mr. Willis who had been elected at a previous meeting. Debaters: Upon the Affirmative, Messrs Marshall and McLemore; Upon the Negative, Messrs. Scot, Adger, and Minor. There was no discussion of the question by the House. The vote of the House decided the question in the Negative. On the Negative, Messrs. Smith, Patterson, and Bryan. The Treasurer's report was then submitted and excuses for absences and other finable offenses were heard and acted upon. The report of the Committee appointed to canvass college for subscriptions for the Magazine was heard and accepted, and the Committee was, upon motion, discharged. It was then moved, seconded, and carried to appoint another Committee for the same purpose. The President appointed Messrs. Daniel, Roberts, Claiborn, and Bruce. The President stated, on behalf of the Joint Committee appointed by the two societies to select an annual orator and the Magazine Prize Committee, that an orator had been selected but had not been heard from as to his acceptance; and that Professors Smith, Price, and Minor had been appointed Magazine Prize Committee, but that, Prof. Minor having declined to serve, the vacancy caused by his refusal yet remained to be filled. Mr. Lefevre moved that the speech of Mr. Hunt, delivered at the last Trial be printed, the Society bearing one-half of the expense of the publication, and that a committee be appointed to confer with Prof. Venable and the Washington Society, and see to the printing. Seconded and Carried. 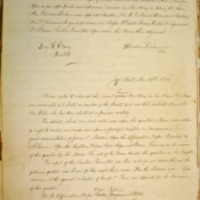 Mr. Wickham, after the passage of a motion to return to the subject of excuses for fines, appealed from the decision of President in sustaining four fines for whispered conversation. His appeal was seconded and sustained. Mr. Lefevre offered the following amendment to the By-Laws: Resolved that Art. IV. of the By-Laws be amended by the addition of Sec. 10. “A motion to reconsider a vote shall be disallowed unless it be offered at the same meeting at which such vote has been taken or at the one immediately subsequent thereto. Furthermore a reconsideration shall not be moved save by one either actually or constructively voting with the successful party. Seconded by Mr. Felton, and laid upon the table for one week. Mr. Woods moved that those gentlemen who inted intend contesting for the Debater's medal meet and decide the time and question for the competitive debate, on Wednesday next, Dec. 3rd. at 2 o'clock. Tabled. ”It was moved, seconded, and carried to excuse Mr. Martin from the payment of his initiation fee. Mr. Martin's resignation was then accepted. The Vice-President then offered his report, excuses were heard; the second roll was called; and the President declared the House adjourned. University of Virginia. Jefferson Society, “Jefferson Literary and Debating Society Minute Book,” 1879 November 29, WWP17248, Jefferson Literary and Debating Society Records, Woodrow Wilson Presidential Library & Museum, Staunton, Virginia.